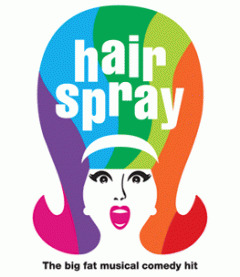 Hairspray is one of my favorite musicals of all time. It's a tricky thing, going to see something you adore...because a couple of wrong moves and it could all be ruined. I think it would be pretty hard to destroy Hairspray, but I have seen the most elementary of shows spoiled by everything from amateur sets to poor acting. First, Tracey Turnblad is supposed to be fat. Not a tall built-framed girl with baggy clothes that attempt to make her appear fat. Tracey was played by Jennie Neumann and I was slightly disappointed with the casting. At least put a fat suit on the girl, yeesh. Jennie, this is the only time in your career you will get dissed for not being big enough - bask in this glory. Of course if I was annoyed that a not-fat-girl was playing the fat girl then you must know that I would need to comment on the Asian (I cannot place the ethnicity so I am going with the broader assumption that her ethnicity is something in Asia then saying something such as Phillipines and being wrong) playing the part of Little Inez Stubbs - the little black girl. (Is that even PC to say black? I never know anymore). Anyways, this must have pissed off more than just me - even if no one else said it. The first act of the show dragged on a little longer than one would hope...it was one of those acts where you thought, "Hum...maybe there is no intermission?" Then the intermission comes and you think, "Holy crap, it's only half over?!?" Thankfully, the second act was shorter than the first. My favorite song of the show is usually Good Morning Baltimore, but it lacked in this production. Maybe it was because this Tracey didn't have the pipes that some others have had or scene wasn't as grandiose as could be...whatever the case - not pleased. As for the good things: Everyone else was very well cast, Jay Brazeau as Edna Turnbald was brilliant, You Can't Stop the Beat and Without Love were possibly the best I have ever heard, and Seaweed Stubbs was hilarious - and did the jokes which (hopefully) went over the heads of the 5 year olds sitting next to me, but still brought some raunch to an otherwise G-rated production. The best part of the show, by far, was Motormouth Maybelle played by Alana Hibbert singing I Know Where I've Been. If I had a soul, I probably would have cried. Unfortunately I don't, but even as a soulless betch I was moved. It was half the message of the song, which was also one of the main themes of the production, and half Hibbert's power vocals that really did me in. Overall I was pleased and thought the show was deserving of the standing O.